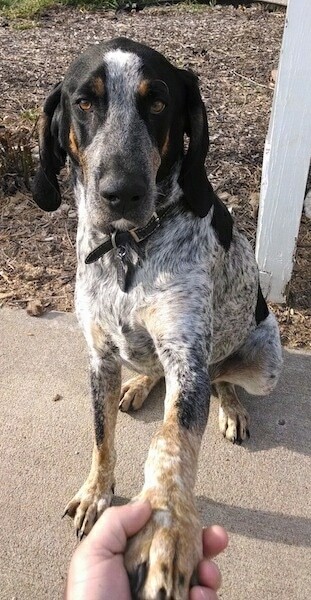 Waylon the Bluetick Coonhound at 4 years old—"Waylon is not an active working hunting dog, as far as me training him. Obviously hunting is in his blood and he has an amazing drive to do so. I got him as a companion dog but he could have been a great hunter. When I picked him out he was a nice plump little pup, then when it came time for him to be away from his mother he and the other two males in the litter had gotten Parvo. He was down to skin and bones. The breeder got him and the other pups to the vet in time for shots but they said they understood if I didn't want to adopt him. I however did want him. I hand fed him for almost two months and got him healthy again. He now weighs 86 pounds and is very active with no problems from having Parvo as a pup. He has a 175 acre farm to run on everyday and I do believe he has sniffed every square inch of it." The Bluetick Coonhound has a broad head with a domed skull. The muzzle is square in profile, long, broad and deep, with a predominant stop. The round eyes are dark brown, large and wide set. The ears are thin and are set low. The legs are straight from the elbows to the feet. The tail is carried high, tapering to a point. The hind legs are long and muscular. Dewclaws are generally removed. The feet are compact with well arched toes. The smooth, glossy coat is short and dense and feels a bit coarse to the touch. The coat color is dark blue, with a thickly mottled body, spotted by various shaped black spots on back, ears and sides; tricolor coat has a uniquely speckled-blue look to it. Its heavy ticking is actually composed of black-colored hairs on a white background, creating a bluing effect. The head and ears are predominantly black. The dog can come with or without tan markings; when they do appear they should be over eyes, on cheeks, chest and below tail, and will have red ticking on feet and lower legs. AKC standard prefers more blue than black on body. There should be more blue ticking than white. 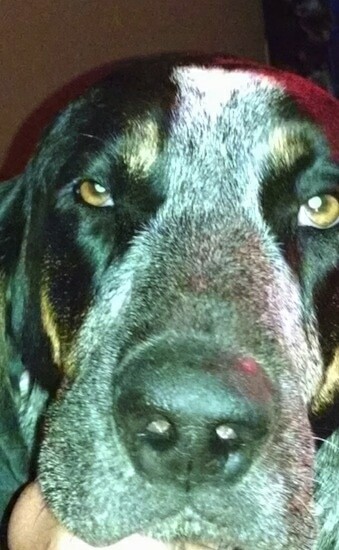 The Bluetick Coonhound is a very intelligent dog. Very devoted to its family, it makes a good companion dog. It does well living indoors and plays a fine guardian to his family and home. They are usually best with older children, but can also do well with younger ones. Some can be a bit dog-aggressive if the owner is not a strong leader relaying the message to the dog that is unacceptable behavior. Owners need to be this dog’s firm, confident and consistent pack leader in order to bring out the best in him. Socialize well, preferably while still young, to avoid them from becoming reserved with strangers. 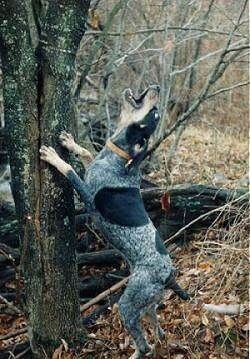 The Bluetick is a passionate hunter and should not be trusted with non-canine pets. This breed is extremely alert, attentive, and able to work over difficult terrain in bad weather. Do not let this breed off the leash in an unsafe area, as they may take off after an interesting scent. They have a strong instinct to tree animals. Raccoons inhabit all states and provinces in the US mainland and Canada, and have for centuries been pursued by hunters. Each year, hundreds of licensed night trials take place. Each trial lasts approximately three hours and involves three to four dogs. Points are given according to the dog's ability to find, trail and tree a raccoon. Points are lost for treeing game other than raccoons. Each dog has a unique "voice" which its owners usually can recognize. 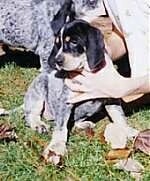 The Bluetick does not have a normal sounding bark, but rather a loud bay cry that almost sounds like a short howl. Blueticks are curious and have a tendency to follow their noses. If they pick up a scent they may wander off and not even hear you calling them back, or not care to listen, as they will be too busy trying to find the critter at the other end. Take care when letting them off leash that you are in a safe area. The Bluetick has extremely good eyesight, which allows it to work well at night. The Bluetick Coonhound excels in these trials. They can also be used to track fox or even cougar. 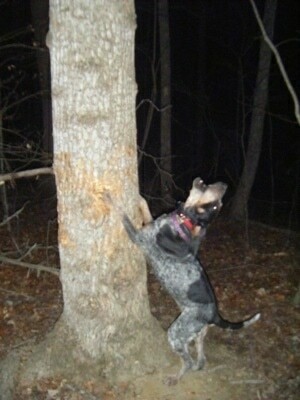 The Bluetick has a fearless and warrior-like approach to the hunt. This breed may drool or slobber. Prone to hip dysplasia, cataracts and Krabbes disease. 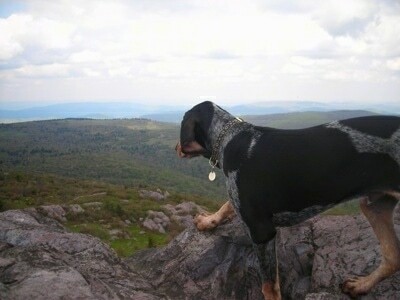 The Bluetick Coonhound is the state dog of Tennessee, where it is said to have originated. 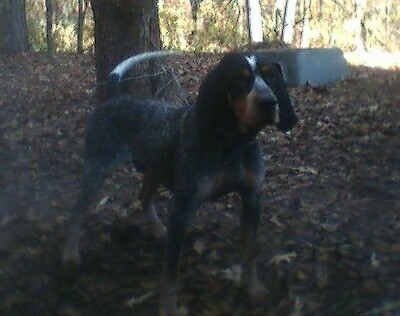 Selective breeding in Louisiana of Foxhounds, Curs, French Hounds and English Coonhounds produced the Bluetick Coonhound. The Bluetick was originally recognized by the UKC as the English fox & Coonhound, which included the Bluetick,Treeing Walker and English Coonhounds all in the same breed. The breeds were later separated into their own breed. In 2008 the Bluetick Coonhound was recognized by the AKC in the Miscellaneous Class. "This is UKC bench show champion Xerxes. Xerxes is 2 years old. He is a 73-pound male out of Blue Boy Cody x Tanna Bell. He is a good bawl mouth hound. We are working toward earning a night champion degree now. We live in Covington, Georgia." 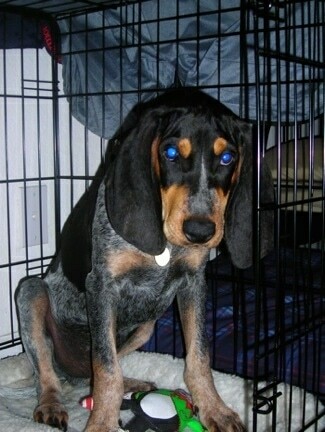 "This is my Bluetick Coonhound Arie Luyendyk, after the racecar driver. I have not sent in his registration with the UKC, but I likely will get around to it; I'm in no rush. He was purchased from the Bayou Bluetick kennel in Mobile, Alabama for $300 and was the pick of that litter—the only male out of 7 puppies. He is a wonderful dog. He absolutely loves everyone and everything: dogs, kids, everyone. He is over 70 pounds now and his father was 85. His coat is beautiful, he has a unique spot on his back that looks excellent and his ears have brown markings on the edges that you see only when he is facing you and his ears are perked. I had no idea this breed would be so pretty." "I picked this breed based on much of the information contained in your site. I read the full report on probably every dog on your site four or more times. I was obsessed with finding the right breed for close to four years and kept coming back to the Bluetick Coonhound. I am not a hunter; he was not purchased to become a hunting dog and so he's never been trained to hunt. I got him to be a long distance hiking companion." "Next summer I plan to through hike the 3,600 mile long Continental Divide Trail with Arie. I have a backpack built by a company called Ruffwear fit for a dog. He'll carry much of his own food and water and even some cold weather clothing I have purchased for him. He'll have, for the coldest times, two fleece jackets, boots and a neck warmer. I also plan to carry a lightweight sleeping bag for him during any cold times. The trip will probably take us the better part of a year to complete, and it will be a tremendous test of both of us." "In the woods Arie will not leave me. We spend a lot of time on the Florida Trail in the Johnathon Dickinson State Park down here in Jupiter, Florida. He's excellent on trail; I never trained him and he is simply perfect. He'll run ahead, sniffing and snuffling along, but if the trail bends he's always sitting there waiting for me to come around the bend, and then he's off again. He'll go around a corner on the trail and I'll even step off into the woods and hide from him, but within 15-20 seconds he's realized I'm not there and turns to find me, which he does with ease, his nose directing the whole time." "He digs and digs the backyard. It's not pretty back there and I blame myself because I don't walk him nearly as much as I should. But happily I am moving out of south Florida to western Maine to live in a small town in the woods called Rangeley. Rangeley lies on the Appalachian Trail, so Arie and I will have lots to do." "This is Clary's Lazy Daisy, affectionately known at home as Daisy. 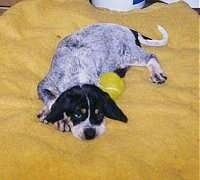 Daisy is a Bluetick Coonhound. Daisy is UKC/AKC registered. She is a UKC Show Champion and Nite Champion." 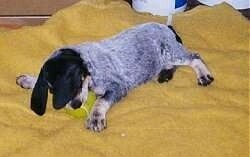 Bluetick Coonhound puppy playing with its toy.